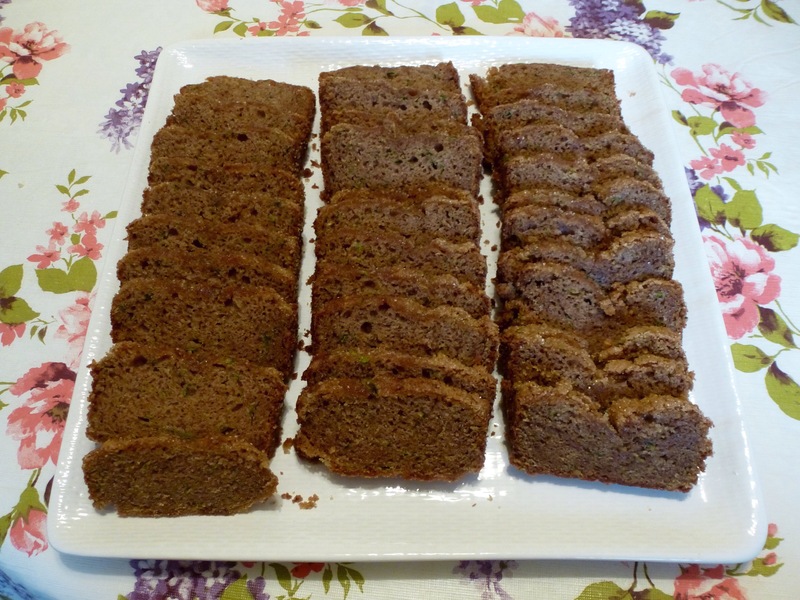 There are so many zucchini bread recipes out there that readers are probably wondering why I would post another one. But this recipe, a combination of several recipes, is different, and my favorite of all the zucchini bread recipes I have come across. What makes it special is that, halfway through baking, you sprinkle the top with Demerara sugar. The sugar gives it a caramel-like sweet crunch that is a nice textural contrast to the soft bread. You can, of course, adjust the recipe to your liking by adding some mini chocolate chips, coconut, chopped pecans, or walnuts. You can also sprinkle the top and the pan with cinnamon sugar. I usually make two batches of batter at a time. If I am going to make a mess of the kitchen grating zucchini, I may as well have plenty of bread to show for it, and this always disappears quickly! Preheat oven to 325 degrees. Grease two loaf pans. In a mixing bowl beat together the sugars and oil for 1 minute. Add the eggs and beat 2 minutes until thick. In a separate bowl sift together flour, salt, baking soda, baking powder, and spices. Add the dry ingredients to the sugar and egg mixture. It will be thick. Add vanilla, then zucchini. Pour into prepared pans. Bake for 20 minutes, then rotate pans and sprinkle each loaf with 2 Tablespoons of Demerara sugar. Continue baking 20-30 minutes longer until an inserted toothpick comes out clean. Remove bread pans from oven to a rack and let cool 10 minutes. Run a spatula all around the edges of the pan. Remove bread from pan and let cool completely on rack. Makes 2 loaves. This entry was posted in Breads, Breakfast, Cakes, Dairy-free, Desserts, Vegetables. Bookmark the permalink.